Cant think of the number of names the leaks had for the HTC One M8’s successor but HTC has kept it straight and simple – HTC One M9 it is! Earlier today at the MWC 2015, HTC unveiled the much anticipated flagship and while much of the rumor mill had it right on the specs, there was only one flagship – no HTC M9 Plus or whatever big sized phone was being speculated with variants of MTK processors! Lets see what the HTC M9 brings us. The M9 looks exactly like the M8 and this is where HTC seems to be creating a ‘clan‘ of the flagship device it makes. However the M9 feels a tad compact (9.6mm) and also weighs lesser (157gms) than the M8. This in a way makes sense as not all the times a change in looks is mandatory as long as the things under the hood are upgraded and the OS that powers the device has considerable amount of changes over a period of time, for the users to appreciate it and makes sense. And of course a good camera being one of the top 3 requirements of buyers these days, HTC has upgraded it but thankfully no protruding bumps here like the way we have seen on the iPhone and Samsung Galaxy S6 – not that it is a bad design but a bump avoided is a design marvel! 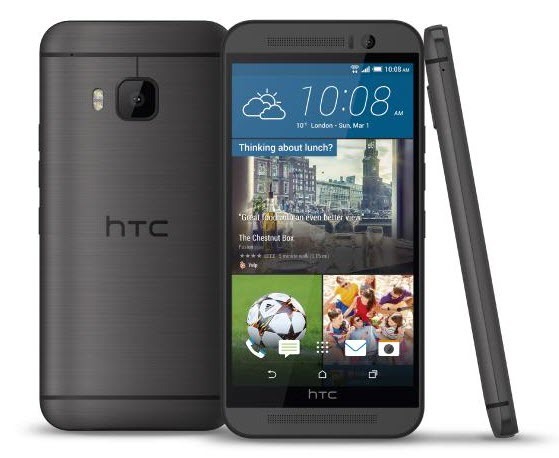 HTC has introduced some new colors but the Gun Metal Gray has been our favorite all through. Just like Samsung released the S6 with the all new TouchWiz, HTC is following suite with Sense 7 on the M9. Just like the new TouchWiz UI, Sense 7 promises to deliver a blazing fast performance with the 810 chipset, keeping the customization to what is necessary thus keeping it as close as possible to the stock Android and more so incorporating the highly successful material design concepts into its UI. Having said that, there are new options for changing the themes, generating your own themes, an all new blinkfeed appearing on the lock screen as well, and options to change launchers, much to the delight of the users. All these are steps in the right direction and we must see more people around the world falling in love with the Sense UI that has flattened icons and many changes to the color schemes! Performance – Ok, its way too early for one to start giving a verdict on how S6 compares with the M9 in terms of performance. We have seen the AnTuTu Benchmarks of the new Exynos processor shoot beyond the 60k range. But mere numbers will not be an indication of the performance. Both Samsung and HTC have worked real hard on the UI that powers the devices and they should be real close in terms of performance, however the look and feel of the UI itself is relative. We will have to wait and see who users like the all new TouchWiz UI but we have loved the Sense UI over TouchWiz when it comes to appearance and performance. With respect to the battery, we will have to run our tests to actually say anything at all though at the face of it, the battery capacities seem to be on the lower side but the processors are claimed to get the batteries running longer than their predecessors. Camera – Samsung has always stayed ahead of the HTC in terms of the camera and our feeling is that it would remain the same here. Do not go merely by the count of the megapixels. S6 has an added advantage here with the OIS while the M9 does not, thus night shots with S6 will turn out better. We will run our tests however to see how the cameras perform. While there is no information on the pricing of the M9, HTC says the phones should start shipping by the end of March. It will be very interesting to see what sort of pricing will HTC come up with and also availability of the phones across the globe. In any case, most of the locations should have these phones by April-May time frame and folks around the world have one heck of a decision to make with most of the other flagships landing into their regions around the same time. While the overall design of the M9 matches its predecessor, an upgrade in the processor and the camera is a welcome change in trying to keep up with times and pitching against other flagships. The all new Sense 7 should provide the users with a fresh breath of air, especially when much of the user base is loving Android’s material design and cant get enough of it! Staying away from gimmicks M9 promises to deliver the best. We will be back after we get our hands on the M9, for a detailed review. Previous story Samsung Galaxy S6 and S6 Edge unveiled – Mixed bag of surprises!